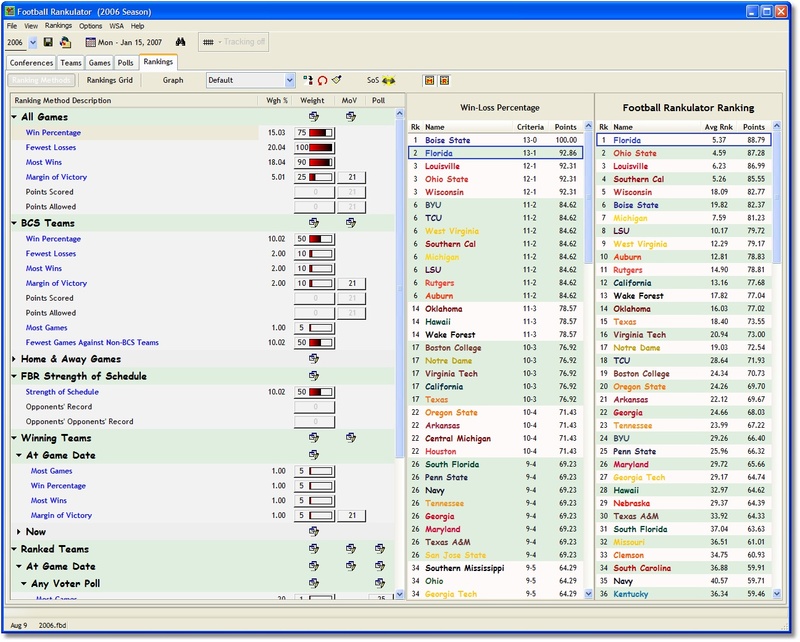 Football Rankulator is the award winning software utility which allows you to create your own computer rankings of college Division 1A football teams. You can also keep an eye on the conference races, team schedules and strength of schedule, the polls, and the BCS standings. In the beginning we had the AP and Coaches polls. Then came the Bowl Championship Series (BCS). The BCS included the AP and Coaches polls, but added strength of schedule, quality wins, and a bunch of computer rankings to the mix. Computer rankings have been a big part of the BCS formula from the start. However, the details of their inner workings remain hidden, such as the criteria they use, the reason some teams go up after they lose and other teams go down after they win. If you want answers to these types of questions, well, you have come to the wrong place! We do not know either. But now there is Football Rankulator. With Football Rankulator (FBR) you can create your own computer rankings. From dozens of ranking methods, you decide what is important and what is not important. You decide how much weight to give a particular ranking method. If you do not like the results, change the criteria. Best of all, you know how it works because you are in control. There is also a unique strength of schedule calculation. You can actually see the break down of opponent schedules and opponent opponent schedules. And like the rankings, you can control how your version of the strength of schedule works. There is no data entry. The Division 1A and 1AA data are provided free of charge, i.e., schedules and scores plus the AP, Coaches, and BCS numbers. Datafiles are updated in a timely fashion and available for download so you do not have to enter a single score, and the software will even download the datafile for you. Of course, if you want to enter the scores yourself, you may. If you follow Division II or III football, the software will allow you to enter their schedules and scores. This site does not contain serial number, crack, keygen Football Rankulator serial number : serial number is the simplest type of crack. A serial number(cdkey,product key,etc) is register the program as you may already know. a crack or keygen may contain harmful software. If you cannot find the exact version you want, just give it a try. for more information read .nfo/.txt/.diz file include in zipped file.